No subject is more important than time. Time rules the universe, thus wisdom. Just announced research breakthroughs in rejuvenation (at least in cells and mice) give hope to those who view aging as the disease it is. Eternal life, will, no doubt, make higher wisdom more precious. About a century ago, the Theory of Relativity caused a huge ruckus, mostly because of its prediction of TIME DILATION. Now we got used to time extension from fast motion: it has been thoroughly checked experimentally, big time. Yet, it is important to understand that Time Dilation is NEARLY A TRIVIAL OBSERVATION, once the correct axiomatics is in. Having the correct axiomatics is crucial, for further advances in philosophy and physics. Correct axiomatics allows to observe the true facts and the important theorems. Axiomatics is the metalogic: it is more important than the logic it gives rise to. In both philosophy and physics, the understanding of time, even by supposedly top notch researchers, seems to be lagging. When a train passes by at speed v, the time therein does not just appear slow, it is slow. It is easy to understand why. At least, so I claim, and I will demonstrate. Suppose Alice and Sophia are on the ground (visualize a flat Earth of infinite extent, to simplify the context). They measure time, each with their personal light clock. By letting some of the light leak, my style of light clock comes with a pulsating tail of light. Let Sophia take off for space. What does that mean? She accelerates (say with constant acceleration A). The light tail of her clock elongates, stretches. From Alice’s viewpoint, the beat of Sophia’s light clock goes down. The situation is even worse with the next beat, at time 2(dt). And so on and so forth. So, from Alice’s point of view, Sophia clock slows down ever more, as long as Sophia is accelerating away at acceleration A. What happens when Alice looks within Sophia’s spaceship? The same situation exactly. As the photon bunch comes down to meet the on-rushing mirror, and it meets it early, the mirror it came from recesses, by as much (we assume everything in Sophia’s spaceship is hyper rigid). So when the photon bunch catches up with the starting mirror, to complete the beat, it has to cover double that, PLUS the supplementary distance covered by the initial mirror, due to the on-going acceleration. So Sophia’s time, as observed by Alice, is slow and getting ever slower, as long as the acceleration A persists. When the acceleration stops, Sophia’s time stops slowing down. It is now just slow. By as much as it slowed down during the acceleration (that’s why the usual approach of Relativity textbooks is dumb: they neglect the accelerative process, so students cannot understand how the slowing down arose). 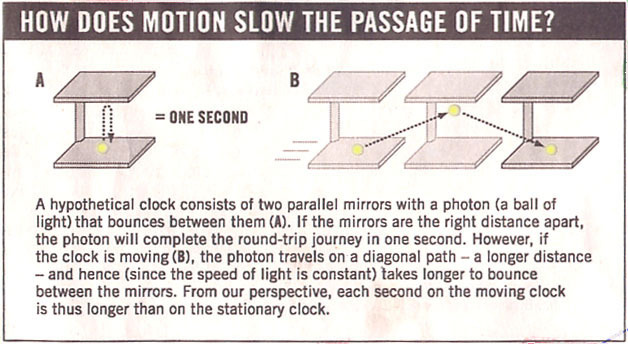 The effect has to do with the light in the moving frame having to cover a distance than is ever greater, the greater the speed V of the moving clock. The mathematics is Babylonian level (Pythagoras theorem was discovered earlier, in Egypt, and Babylon). So when V approaches c, Sophia’s time slows down enormously. An arbitrarily large number as V approaches c.
Some may wonder: if Time Dilation is such a triviality, what the big noise about it, and where is the “Relativity” in all this? 1.In the fact that Henri Poincaré’ s law of the constancy of the speed of light was implicitly used during the computations… Which indeed had to do with relative speeds, or relative accelerations. 2.In identifying light clock time with time in general. Otherwise Sophia could tell, from within the spaceship, without looking outside, whether she is moving uniformly. That would violate the “Principle of Relativity” of Galileo according to which such a motion is not detectable (Henri Poincaré generalized to electromagnetism what he baptized at the time the “Principle of Relativity” in 1904, while he was lecturing among the savages of the New World; unsurprisingly, they don’t remember, and attribute the work to Einstein, ironically enough). The direct approach above is primary school level. It also directly makes the so called “Twin Paradox” into an absurdity. Instead, of just hand waving that said paradox is not valid, as Feynman does in his excellent Lectures on Physics, because one twin was accelerated, and the other not, I tackle that from the start, as it should be. This entry was posted on June 17, 2014 at 11:51 pm and is filed under Foundations Of Physics, Physics, Time. You can follow any responses to this entry through the RSS 2.0 feed. You can leave a response, or trackback from your own site. Are there implications for this nature of time and motion in the everyday affairs of man? What is the use of a new found progeny? GPS uses both ways of slowing down time crucially. It could not exist without awareness of that effect. Soon GPS will be used for everything, including agriculture by robots. Nicely done. Indeed strange textbooks, or Einstein, did not cover the effect of acceleration on time at the outset. Challenge for you: find as simple a treatment for relativistic speed addition… That is without going through the Lorentz-Poincare’transformations first.